Ballerina Bunny just loves to dance! 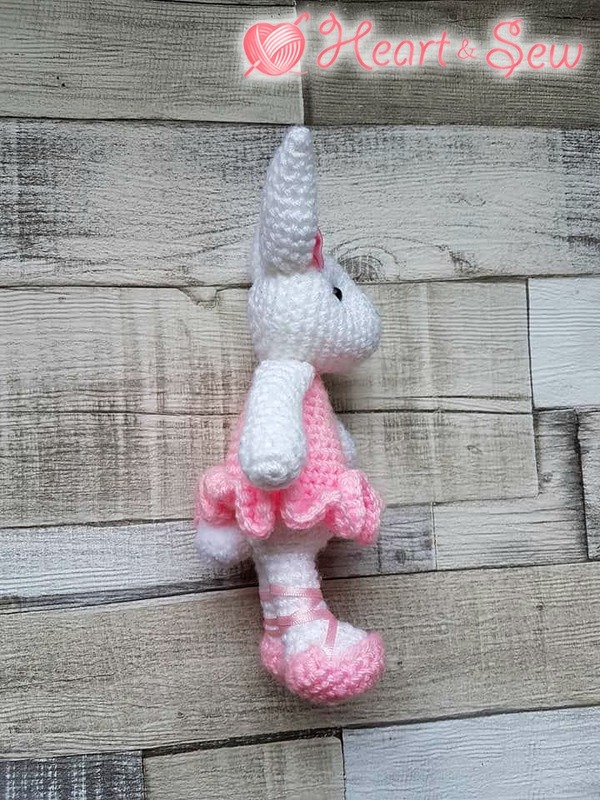 Due to the popularity of my Ballerina Mouse pattern I thought I'd design a little bunny dancer too! The mouse was the first pattern I ever designed and I have come a long way since then. This ballerina pattern is totally different to the mouse. The tutu is better, the feet have more shape and she has a little, white pom pom tail! On the whole this pattern is a lot cleaner. I may redesign my mouse with the new improved body, what do you think? 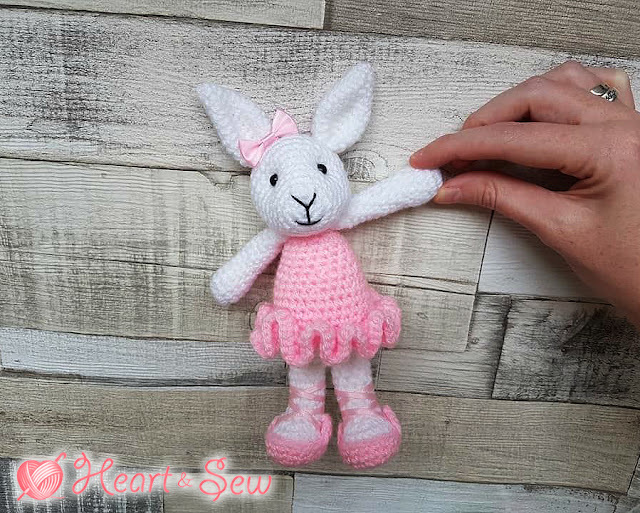 Ballerina Bunny stands at just over 6 inches tall (7 and a half inches including ears) and would make the perfect pocket pal to accompany any little aspiring ballerinas you may know! As always if you do make your own Ballerina Bunny please post your pictures on my Facebook page! I would love to see. Please note: This pattern is property of Heart & Sew. This pattern is not to be redistributed for sale or for free. Text and images contained within this pattern are not authorised to be placed in full or in part on any website, book, magazine, blog or forum. This pattern is not to be translated or altered without expressed written consent. Currently I do not allow my patterns to be translated. 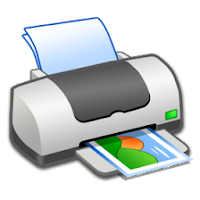 You may however: Post my pictures on your website, blog or forum with a link back to this post. You may not post the pattern or any parts of it. You may however: Sell your own handmade items made from this pattern. The items must be individually handmade on a small scale by you and not mass produced in any way. Credit for the pattern in any online description (eg: "Created using a Heart & Sew Pattern") would be greatly appreciated. You may not claim, directly or indirectly, to be the original designer or author of the pattern. Please see my full disclosure for more details. I have included the exact yarns and materials I have used via the links below. 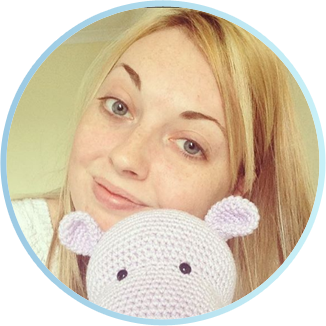 I do my shopping at LoveCrochet - Shipping to the USA is $4.95 and free when you spend over $60.00. You can check the exact shipping cost for your country here. - 50g StyleCraft Special DK in "White"
- 50g StyleCraft Special DK in "Candyfloss"
Pssst! Hold down Ctrl and P to print the pattern! Difficulty: Moderate difficulty - Beginners may struggle with crocheting the legs together. Must know how to work in the round, increase, invisible decrease, chain & change colours. Do not join rounds, work in a continuous spiral unless stated otherwise. It is a good idea to use a stitch marker to mark the end of each round (You can use a bent paper clip or hair grip!) My notes, tips and further instructions are in purple italics. Our Bunny's legs and body are worked as one piece, there are no seams. To do this we will crochet both legs separately and then crochet them together. Once they are joined together we will continue crocheting around both legs to form the body. For this next round you should be making a total of 6 decreases. Fasten off (do NOT slip stitch as usual before fastening off) leaving a yarn tail. Stuff feet and legs, but do not over stuff the feet. Lay aside and start crocheting the second leg. After your 6th sc add a second st marker in the next st. This will insure we work into the correct stitch when we crochet back into this leg. Now we will crochet the 2 legs together by crocheting directly into the next leg. Hold your 2 legs together, feet pointing towards you with your unfastened leg with your hook in on the right. Round 14 (continued): 1sc in the st directly next to fastened off knot on first leg, then 9sc. 9th sc should be in the st with the fastened off knot. Now we crochet back into the other leg. Our first sc should be in the st with the stitch marker we added after the first 6sc at the start of the round. You can remove this stitch marker completely now. Round 14) Continued: 1sc in the next 4 stitches of the other leg. Our last stitch should be in the stitch marker that marked the end of our second leg. This is still the end of the round for our body. Well done, you have successfully crocheted the legs together! Now we can start the body. We should think of the previous round where we crocheted the legs together as round 1 of the body. Round 8) Back loop only: 1sc in each st (30) This is where we will attach the tutu later. Slip stitch into the next st and fasten off leaving a yarn tail. Do not close body - the bunny head will be sewn on over the open hole of the body to cover it. Stuff body. Lay your bunny face down, upside down so the legs are pointing upwards. Insert hook into one of the loops on the back of the body, draw pink yarn through loop and chain 3. As you crochet make sure to crochet over the loose yarn tail or "straggler" until it is completely hidden and secured inside your work. Join the end of round 2 to the start of round 2 using a slip stitch. Fasten off and weave in yarn tail. For beginners who might get stuck on round 6: This round means, 1sc in the next 2 stitches then 2sc in the next st (increase). Attach 6mm safety eyes to the face. Mine are placed between rounds 8 and 9 and spaced roughly 6 stitches apart for your reference. Start stuffing the head. Slip stitch into the next st and fasten off leaving a long yarn tail. Add in any more stuffing you might need. Weave yarn tail in and out the front loops of the remaining 6 sts and pull tight to close. Knot yarn and hide yarn tail inside the head. 1. Take a long length of black embroidery floss on your needle and take it in somewhere that will be hidden (such as the bottom of the head that will be covered by the body) Make sure you leave a long length of embroidery floss sticking out the bunny, don't let all the floss disappear into the head. 2. Bring floss out at A and back in at B. 3. Bring floss out at C and back in at B again. 4. Bring floss out at E and back in at B again. 5. Finally, bring floss out at F and back in at G.
6. Bring floss down and out through the bottom of the head right beside your starting floss tail. Tie both floss tails together tighter to secure your embroidery. Hide both floss tails inside the head and cut any excess. For beginners who might get stuck on round 7: This round means, 1sc in the next 2 stitches then 2sc in the next st (increase). Slip stitch into the next st and fasten off leaving a long tail for sewing. Do not stuff ears. Fold the open bottom of the ear in half to create a realistic bunny ear. It will be sewn to the head in this position, so if it helps you can sew along the bottom to keep your ear folded. Slip stitch into the next st and fasten off leaving a long tail for sewing. Stuff hand firmly, stuff arm very lightly. I only have a little bit of stuffing in the arm part of my bunny. If you over stuff the arm part you will have sausage arms instead of a little, defined paw! Slip the slippers onto the feet. If you like you can glue or sew them onto the feet at this point. Mine are glued on with Fabri-Tac. The tail is simply a little pom pom glued onto the back of our bunny! You can buy these at any craft store or you can make your own. Check out this tutorial for making tiny pom poms with a fork! I would wrap the yarn around the fork about 50 times, and then trim down until you are happy with the size. 1. Sew the arms to the body. They are sewn on the last round of the body directly at either side. 2. Sew the ears to the head. 3. Sew the head to the body. The head should completely cover the open hole at the neck. 5. Sew or glue a pink craft bow to the head. 6. Glue the pom pom tail to the back of your bunny, directly under the tutu. And there you have it! Now you have your own little ballerina bunny to dance with! Thank you, she's lovely! Out of interest why do you use USA terminology? Can't wait to start her! She is so gorgeous. Thank you for this pattern. 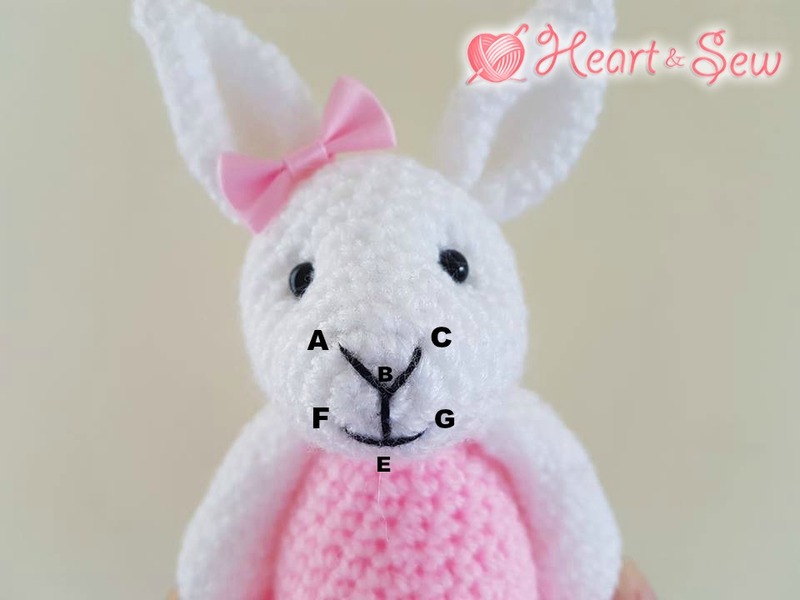 I LOVE this sweet bunny... but I can't copy the pattern to make it?? I love your bunny but it printed out everything including advertisements and comments from others. Is there another way of just getting the pattern? I understand why you don't want it copied and pasted but maybe a simpler copy system. I do appreciate your giving us this fabulous bunny pattern for free and will observe all of your rights. Thank you again!!!! Please help me...I am trying to print this patern but it just wont print at all. It starts...bur prints like a half of the page and then it stops. Hallo, ik heb een vraagje aan u. Kan ik op Facebook ook de Patroontjes om laten zetten in het Nederlands? Hallo, ik heb een vraagje aan u. Kan ik op Facebook ook de Patroontjes om laten zetten in het Dutch?